Saundra Hudson appointed to serve as Board Chairperson of NDC. 'Ms. Hudson truly understands what our organization does in the trenches in our communities, NDC is fortunate to have her serve in such an important role as Chairperson of our Board,' said NDC President Robert W. Davenport. The National Development Council, a mission based non-profit community development organization, is pleased to announce the selection of Saundra Hudson to serve as the Council's Chairperson of the Board. Ms. Hudson is the first woman and minority to chair the organization. She is replacing Samuel S. Beard, founder of The National Development Council (NDC). 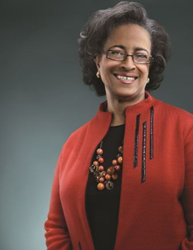 Ms. Hudson's successful career in several industries has led her to her role as Chairperson of the Board at NDC. In New York at IBM Corporation, she worked in technology as a Systems Programmer. Later, she returned to her roots in St. Louis where she continued in the technology field with Olin Corporation as Manager of Information Systems. Ms. Hudson left the corporate world to purchase a franchise which she operated for eight years and helped to strengthen her understanding of capital raising and job creation. Although varied, all aspects of her career path share one common thread, problem-solving. She transitioned this analytical skill-set to her work as President and CEO of the Madison County Urban League. Judge Duane Bailey, Board Chairperson of the Madison County Urban League, credited Ms. Hudson with stabilizing the organization during her tenure and expanding the group's work into developing affordable housing. “Saundra Hudson brought a steady hand to the ship of the Madison County Urban League,” he said. Her work in the Madison County Affordable Housing market was where Ms. Hudson was first introduced to NDC nearly twenty years ago. Ms. Hudson was invited to join the NDC Board of Directors in 2007, because of her extensive experience and community engagement in Madison County, IL. Inspired by her parents, who taught her that education is the key to improving one's station in life. She is a passionate advocate for human rights and has fought for quality public education with the goal of leveraging the future for children, especially those who live in an urban environment. Ms. Hudson has served as an elected member of the Edwardsville, IL School Board for sixteen years, as well as a member of the three-person financial oversight panel appointed by the Illinois Board of Education for East St. Louis Public Schools. Mr. Beard founded NDC, and for forty-five years has served as NDCs only Chairman. He will continue to serve on the Board of Directors and help plan the future of NDC. He will use his experience and wealth of contacts to take the organization to new heights and help lessen its dependency on federal funding. “Sam has been a strong and inspiring leader of NDC from its inception through difficult economic times until today. He is a brilliant collaborator, with a deeply humanistic view of community development. I am delighted that he will continue to be my friend, colleague, and advisor on the Board,” Hudson said. Founded in 1969, the National Development Council (NDC) is a national non-profit organization that has evolved into one of the most progressive and innovative community and economic development organizations in the country. From a seminal role in the earliest days of the community development movement, NDC has grown into one of the most comprehensive providers of financing, development expertise, technical assistance and training for community revitalization efforts throughout the U.S. NDC is headquartered in New York City with offices in Seattle, WA and Edgewood, KY. For more information visit http://www.NationalDevelopmentCouncil.org.